On January 9, 1963 a group of dedicated Christians met in a private garage one half mile east of Owasso, Oklahoma to establish what is now known as Central Baptist Church. Their goal was to become a church of love and faith in Jesus Christ that would reach out to all people and bring them to the saving knowledge of our Lord and Savior Jesus Christ. A short time later this group of inspired Christians moved from the garage in which they were meeting to an abandoned pool hall on Owasso’s Main Street. While still there, the 76 members signed a proclamation stating their desire to become a part of the Southern Baptist Convention. On February 24, 1963 this dream came true as the group was officially recognized as the Central Baptist Church of Owasso, Oklahoma by the Tulsa Baptist Association. Continuing to move by faith, the growing church recommended on March 3, 1963 in a business meeting that the property on the corner of 2nd and Birch be purchased for what would be the first in a series of building plans. The property had two frame houses, which were remodeled and used as church buildings until January 1, 1967, when ground was broken for a new sanctuary. Demonstrating the true spirit of Central Baptist Church, the members volunteered their time and labor to help build their beautiful new sanctuary which was completed and dedicated on April 21, 1968. 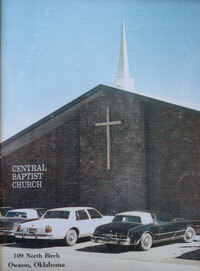 God was certainly blessing Central Baptist and soon the need for additional educational space and a larger fellowship hall caused the church to vote on March 19, 1969 to begin a new building program for the additional space. The new educational and fellowship areas were formally dedicated for use on September 28, 1969. As the church continued to grow, the existing structure became too small to accommodate its growing body of believers. On June 30, 1985, Central Baptist took another step forward and broke ground for its next beautiful facility. The fellowship hall was completed in the fall of 1985 and the sanctuary was finished in January 1986. Formal dedication services for the facility were held on April 6, 1986. In the spring of 2002, we took a significant step forward as we began construction of our current beautiful facility. Its completion in May of 2003 has enabled us to have a state-of-the-art building with great potential for ministry in a rapidly growing part of Owasso. Formal dedication of this facility was July 27, 2003. In the summer of 2006 Central dedicated phase two of the current facilites that opened a brand new children’s wing and youth wing. On June 1st, 2006 Dr. Scott Carlson, a native Oklahoman, came back home after being in Texas, Florida, and Missouri for the previous 20 years to be Central’s Senior Pastor. These are exciting days for Central and we invite you to come and be apart of our future. Since the beginning of Central Baptist Church God has mightily blessed us in our short existence and we continue to look to Him for our future.